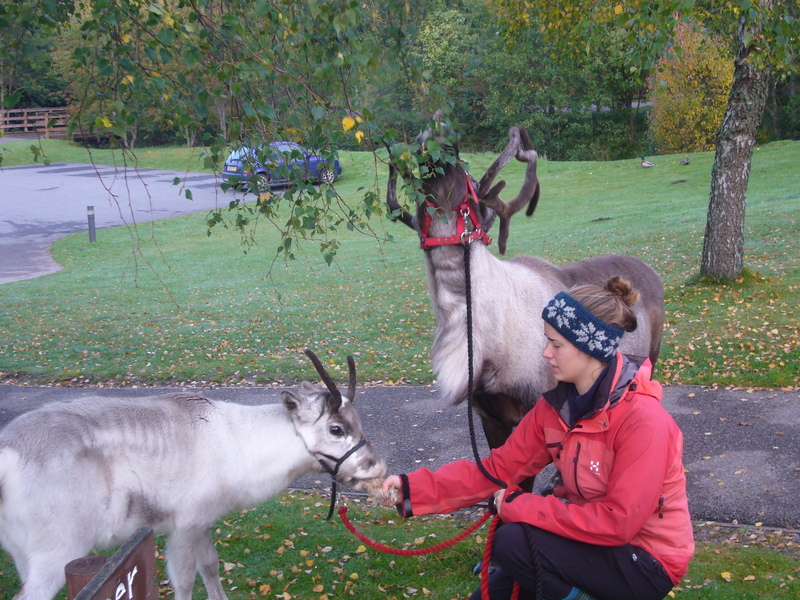 October is a fun time of year as it’s when we train this year’s calves as well as harness training our young Christmas reindeer to pull Santa’s sleigh. Halter training and handling the calves makes them much tamer and easier to handle for the rest of their lives so even if they don’t end up pulling Santa’s sleigh at least we can catch them if we ever need to when they are out in the hills…well, most of the time anyway, some are always wild…it’s in the genetics! 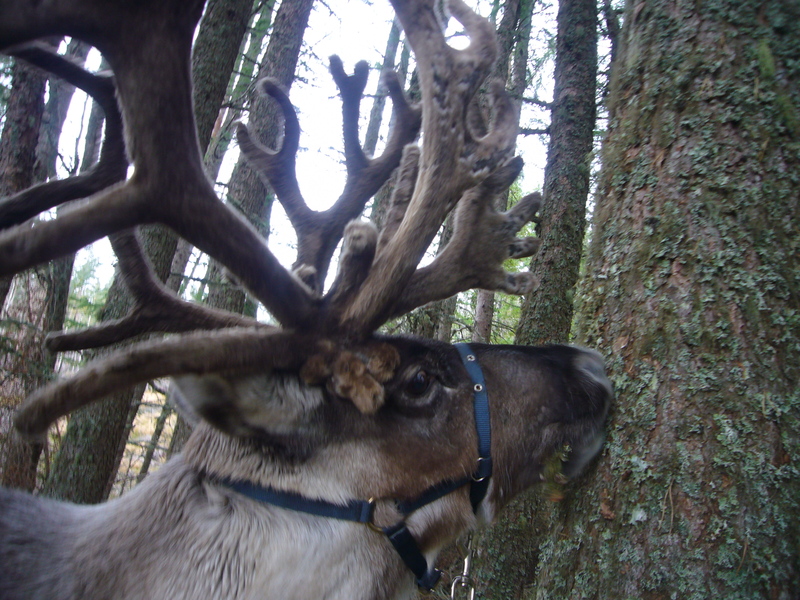 Luckily reindeer are very food orientated, aren’t we all! 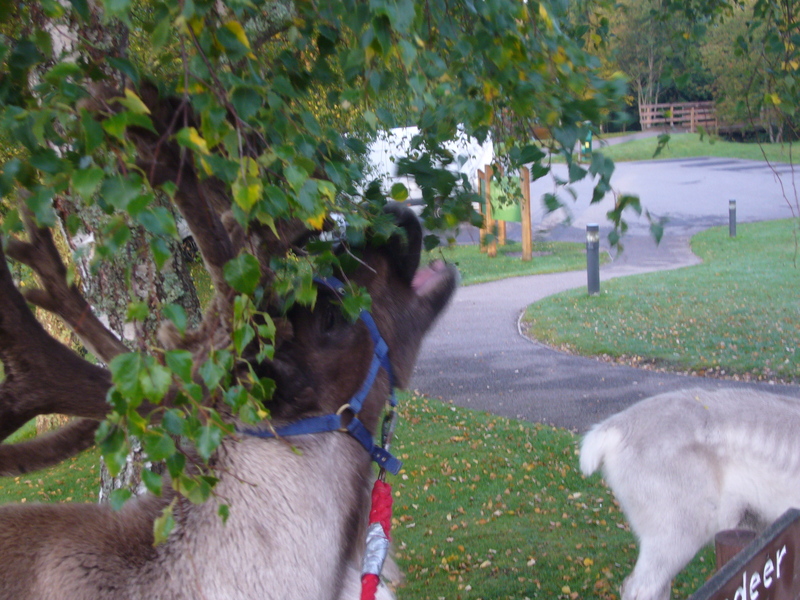 So stage one is to get their heads in a bucket full of tasty lichen, chocolate for reindeer! Lotti luring the calf into the bucket of delights! Once the head is ‘inserted’ a sneaky manoeuvre gets the halter on with them barely noticing what’s happened! Once the wee ones are caught we get ourselves a couple of steady old boys to come alongside and ‘teach’ the calves…this day it was Puddock and Parfa’s turn to be the companions. We have found that they are better behaved without their mums, like some children! So mum’s go back up the hill once they have accompanied the calves down to the ‘training centre’ and the big boys take over. 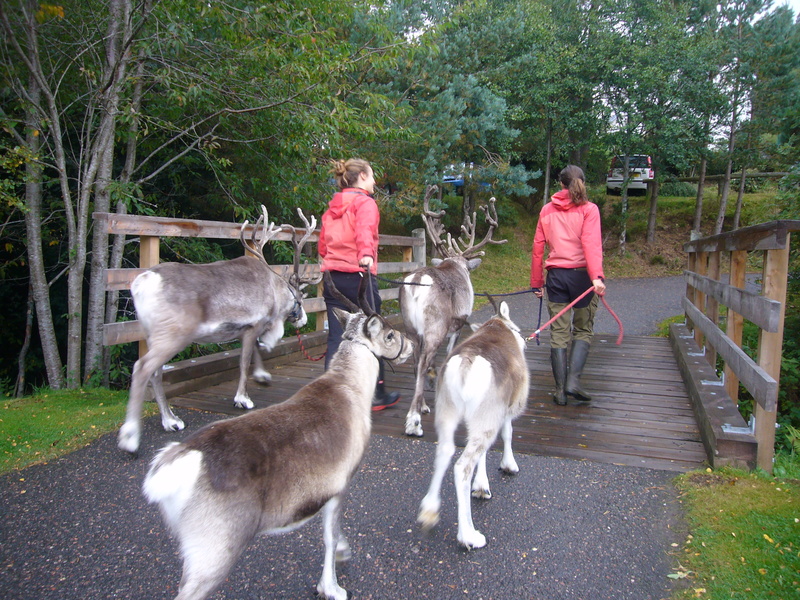 All haltered up, we are ready for a wee walk around Glenmore to see the new sights and sounds……. 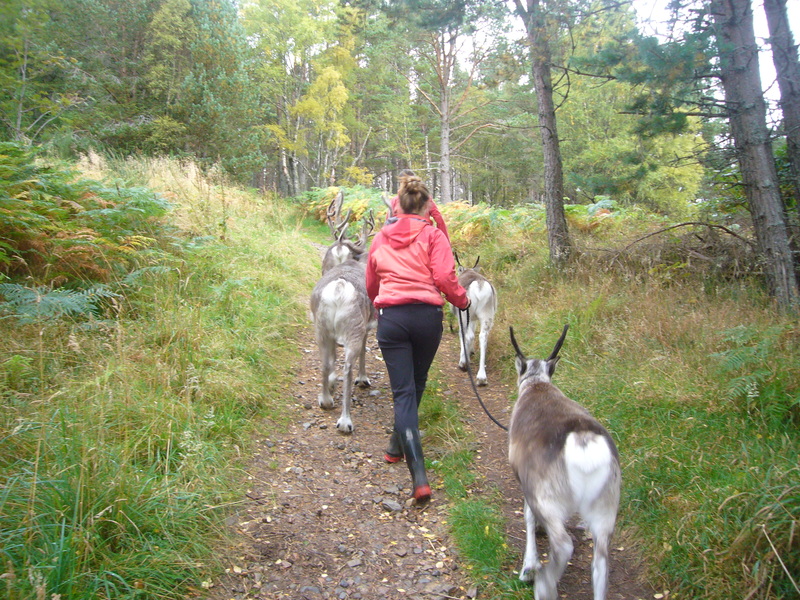 To try and make the walks a ‘fun’ thing we go off into the woods in search of yummy snacks! Enjoying some freshly picked tree lichen from Lotti. The boys enjoy the smorgasbord walks just as much as the calves! Puddock nibbling lichen from the trees. 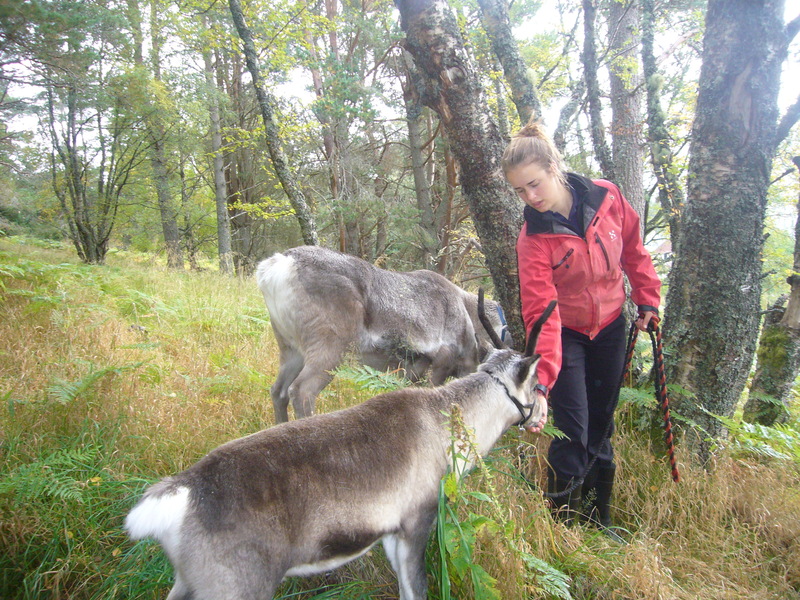 Fresh birch leaves are another favourite, Grunter snacking on leaves while Lotti feeds the wee calf. Moose ready to grab a big mouthful of leaves, it’s interesting to watch the technique. They grab the twig some way toward to base and then pull it throw their teeth and hard pad to strip off all the leaves but leave the twig and tip intact so they don’t actually damage it, clever! 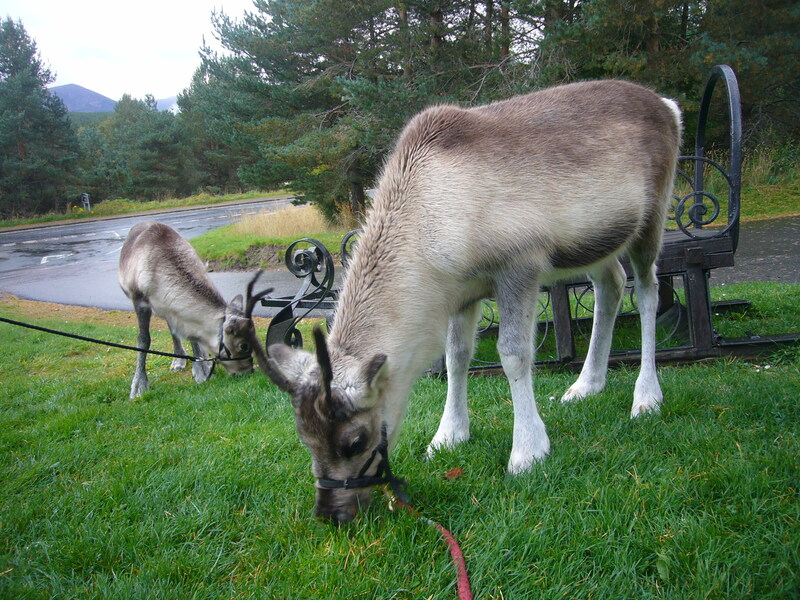 The training/buffet walk finishes with a wee graze of the grass. Lastly with heads snuggly back in buckets of lichen, halters are carefully removed! After 2 or 3 outings like this they will be pretty much halter trained. The key to winning them round is lots of tasty snacks and pockets full of lichen as you will have seen and a couple of old boys who can be a good influence!